After lunch at St Bede's, I went back on the Northern Line to central London (it was a sweltering day) for the seminar on the occasion of the launch of Dr Laurence Hemming's new book "Worship as a Revelation". As a scholar involved in the supervision of doctoral work, Dr Hemming did not arrange for a mere celebration of the publication of his book but invited several scholars to offer critical comments upon it. The resulting discussion was highly-charged and illuminating. 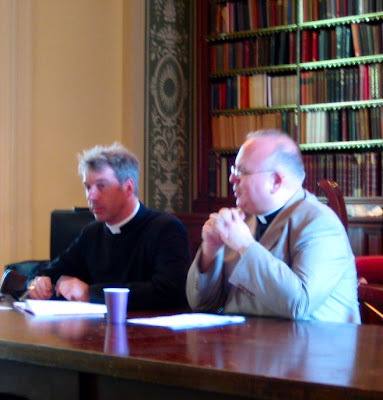 The Dominican fathers, Aidan Nichols and Thomas Crean robustly questioned the use of Heidegger in support of the critique of the rationalist character of 20th century liturgical reform and Fr Nichols also raised doubts about the book's commendation of the research of Margaret Barker. I offered my own little contribution on this subject but was rather nervous in view of the sheer weight of scholarly expertise in the room. After the seminar, there was a Missa Cantata in the Little Oratory (photos from that in a minute) followed by a reception. 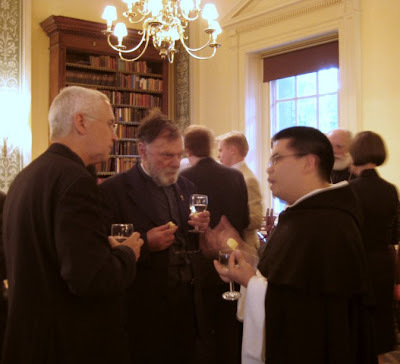 Here, you can see Fr Adian Nichols OP, Bro Lawrence Lew OP, and Fr Hunwicke of the homonymous Liturgical Notes whom I was very pleased to meet, after hearing about him from many good Anglican readers.